Give way, Kiwi turning right. They drive on the correct side of the road down here in New Zealand. But, things are not quite as they seem. For example: Approaching a junction on a main road, where you are turning left into a minor road. The oncoming motorist turning right into the same minor road. Who gives way? They take precedence. You let them cross in front of you. As far as I was concerned this contravenes the rules of roadgoing physics. Add more road users into the mix and it confuses the heck out of me. 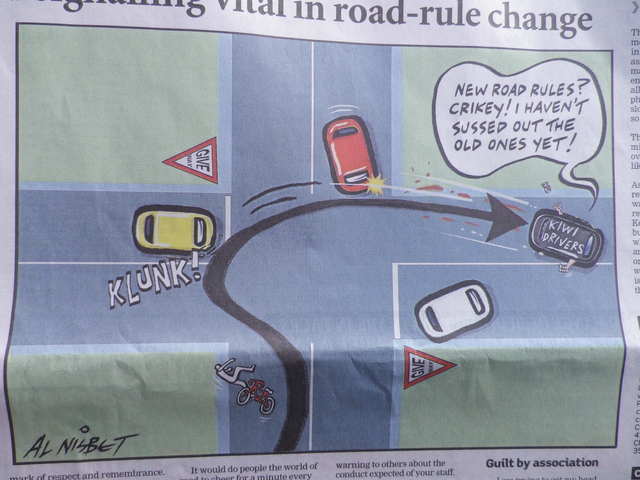 The Kiwi driving rules with regards giving way are in line with the maritime principles. Apparently. The sailors among you already knew that, right? So endeth a short blogspot… except… there’s a twist. On the Friday afternoon we arrive, we collect a budget, used (150k) rental car from the super helpful ANZED. (More on the mighty Bluebird in a future post.) We are then sternly notified that on the Sunday, the ‘give way’ rules will be changed to match UK laws. By which I mean we sit down in the office and get a mini highway code exam. Happily we are not party to the Monday morning commute when carnage would surely ensue. A minor first for my travel existence. When was the last time you travelled to a country for the laws to change whilst you were there? A law that actually affected you? It’s now approaching 2 weeks since the rule change and you still see all sorts of hesitation at intersections. Such shenanigans are not new however: it’s always been thus we are cheerfully told by the locals. Thankfully the roads are so blimmin’ quiet here that it makes little difference. Although perhaps there are heaped car wreckages at the junctions in the cities awaiting tow trucks as I type… It’ll be great fodder for the local “in car footage shock and awe” show Road Madness. Which is a leading contender – by the way – for the title “lamest/tamest reality TV show in the world”. Believe me, it needs the spice a road law change might bring.